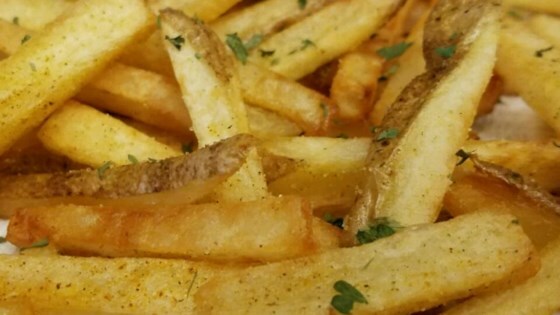 "I don't think most people realize that any decent French fry needs to be twice fried. The first frying in done at a lower temperature, which softens the potato and prepares the starchy surface for the second frying's crispification." Discover the tricks restaurants use to get perfect, super-crispy French fries. Best fries I've ever made at home. I will make them like this (double fry) every time . Quick, easy and delicious. Try par-boiling and chilling before the first fry to make them really fluffy on the inside. Darling husband bought a french fry cutter at the flea market and was dying to make his own hand cut fries. This recipe was a great guideline for making crispy fries. Thanks!